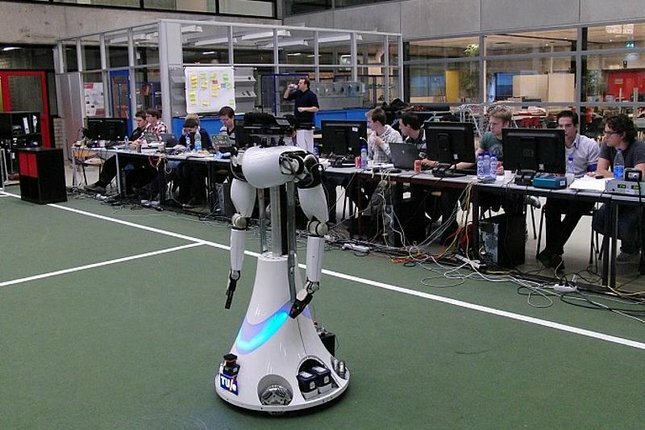 Because of the successful growth of the robotics activities, we opened a new Robotics lab in 2011 combining our haptics, RoboCup and RoboEarth project activities. The lab has a playing field for the RoboCup Middle Size League and a simulated hospital room for RoboEarth and @Home. Also all MSc and PhD students are located in an office area close to the experiments. For more information about Robotics research within the TU/e, please refer to the Robotics Research page.